Rep. Colleen Hanabusa (fourth from left), TCA President G. Lincoln McCurdy (fifth from left), members of the Filipino Community Center, the Consuelo Foundation, the Turkish American community and local elected officials at the ceremony. 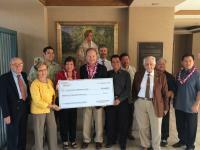 March 21, 2014 - Honolulu - The Turkish Coalition of America presented the Filipino Community Center in Waipahu, Hawaii with a $25,000 donation yesterday to aid the Typhoon Haiyan relief efforts. The donation was matched dollar for dollar by the Consuelo Foundation, a Hawaii-based nonprofit organization. Hawaii has the highest concentration of Filipino Americans in the United States and shares a close relationship with the people of the Philippines. Special guests at the reception included Congresswoman Colleen Hanabusa (D-Hawaii); Edmund Aczon, Chair of the Board of Directors, Filipino Community Center of Hawaii; Consuelo Foundation President Jon Matsuoka; TCA President G. Lincoln McCurdy; Engin Turkalp, President of the Turkish American Friendship Association of Hawaii, Hawaii State House Representatives Ty Cullen and Henry Aquino. TCA is proud to join with Turkish Americans across the country in donating these much needed funds to the relief effort in the Philippines," said TCA President G. Lincoln McCurdy. "Not only will this donation help Filipinos rebuild their devastated communities, but we hope it will also begin a lasting friendship between Turkish Americans and Filipino Americans." “We are very grateful to the Turkish Coalition of America for bringing our communities together with their thoughtful donation, which will be used strategically to rebuild Filipino communities stronger than they were before Typhoon Haiyan,” said Jon Matsuoka, president of the Consuelo Foundation. The donation was the result of a national Turkish American donation drive, which TCA spearheaded and organized in collaboration with Turkish Philanthropy Funds. All of the money raised will go directly to rebuilding efforts on the ground in the Philippines. This is the second of four $25,000 donations pledged by TCA to Filipino organizations in the U.S. The first was presented to the Philippine Cultural Foundation of Maryland on March 7, 2014, and the other two will be presented to the Filipino Community Center of Seattle and the Filipino American Chamber of Commerce of Texas, South Texas in April 2014.